When you drive around the city you never know what you’ll see. This weekend was no exception, only it wasn’t only while driving. And in typical Indian fashion some things were funny, others are just downright heartbreaking and unbelievable. Anyway, here are a few things that captured my attention for various reasons and have contributed to me be being fully over-stimulated and in serious need of chocolate and an early bedtime. 1. The first thing, which completely broke my heart, was a woman who was standing outside our church asking for money who had no tongue. We typically don’t give money, and afterword I wondered if we made the right decision because perhaps this was done to her just so people would give and bad people were benefiting from her pain (reminded me of Slumdog Millionaire). But in any case we gave her a little and felt terrible there wasn’t more we could do. 2. As we drove home we happened to see three camels on one side of the road and on the other, an elephant. The kids love this sort of stuff. 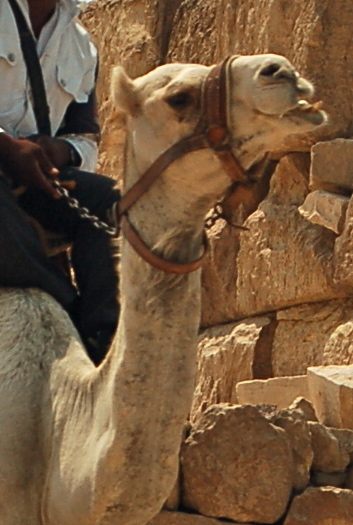 I’m still astonished that a camel is considered a legitimate travel option in a city this big. Hey, whatever floats your boat! 3. A man on a motorcycle with his shot-gun strapped across his back without a case. We decided not to honk at him when he cut us off. 4. Another sad case. A lady at one of intersections close to home who was on crutches and had an ex-ray pinned to her dress to show she was legit. 5. In Big Bazaar (grocery store) tonight a bunch of people were waiting for the elevator. We had a cart with five heavy bags and our three kids behind a couple who had a four-year old and a small pack of diapers in a huge cart. They got in and no one else could fit. I guess that 1lb pack of Huggies was a little too much for the mom and dad to manage. 6. A Westerner driving a motorcycle. Now, I know this doesn’t sound weird, but here it’s not something you see every day. The Hubs told me that last year alone about 750 in our city alone died in two-wheeler accidents. They aren’t the typical transport of choice for the safety conscious, i.e. Americans. Okay, so there’s a few glimpses from my world this weekend. I’ll go now and enjoy my chocolate cake. Feel free to pick your favorite or share something you saw this weekend. When we moved here we decided that putting our kids in a national school. We thought it would be the best way for them to gain cultural exposure and perhaps learn a bit of Hindi along the way. The Hindi is slowly coming along slowly, and our oldest has done as one of only two Westerners in his class. Recently, our second child entered school this year, and while it was a little bit of a challenge for him the first couple of weeks, he seems to finally be coming along. A meeting with his teachers today confirms he has used his charm to make friends and melt the hearts of his teachers and we are glad he is adjusting to the long day away from home. We are glad they’ve settled in, even if sometimes we aren’t exactly glad about what they’re learning. A few days ago our oldest said, “Sh*t” and my husband and I looked at each other–I knew he was probably thinking I had let it slip that day and our son was repeating me. But we both asked him where he had heard this word and he told us that everyone uses it at school. Even the teachers. Like the equivalent of “darn” or “shoot.” So then we had to discuss why we don’t use that word and of course they wanted to know what it meant. Fun conversation. Sometimes it’s hard to explain to them why we don’t do certain things when they are common practice here because we don’t want it to be like an “us” and “them” sort of thing. But ultimately we don’t want them to go back to their home culture and be completely clueless. Being what’s called a Third Culture Kid has enough challenges as it is. I’m sure all this can be quite confusing for them at times–it sometimes is for me and I’m old enough to know how to process it. I thought about when I was in third grade and my best friend at the time taught me every curse word she had gleaned from her older sister. I knew those words were just for the playground or the bus and not to be uttered in front of my parents. Forbidden words said to impress boys. My kids, on the other hand, are having to learn that what might be okay culturally is not okay in our home or in front of their grandparents and cousins when we see them in the near future. I’m not sure they have a filter yet for what is appropriate and what’s not and I’m just waiting for the moment when a colorful word slips out. So what have I learned from this process of trying to navigate the Indian education system and the little things that spring up from time to time that we have to gingerly address? Well, it’s basically like navigating the roads, the markets, and everything else. Flexibility. Without it I would spend every second of my life here in a constant state of frustration. And I do still get frustrated–believe me. But hopefully not as much as I did when we first moved here and I had too many unrealistic expectations. Wait, I still have unrealistic expectations. Maybe someday I’ll get there. I like to think that what my kids are lacking in knowledge of American History they make up in unique life experiences. Should I also mention my son knows how to sing the Indian national anthem in Hindi, but not ours in English? Gasp! So the adventure continues. As does the education–formal and informal–for us all. My heart has been aching for my oldest son for the past few days. He’s experiencing, again, the pain of goodbye. Because we live abroad and all of our family is planted back in the US, goodbye is a all-to-common word. But so is hello. Only hellos take time to nurture and develop into something more substantial and goodbyes are mostly painful. Especially when you’re eight years old. This weekend we got away and made some new friends where we were staying. Our kids swam together and had a great time playing in a giant air-filled ball in the pool and eating dinners together. After a few days my son started lamenting the fact that we only had two more days and how he wished we could stay longer or live close to these friends. By Saturday evening he knew the time was short and had became sulky and irritable. At dinner he took out his anger on his younger brother by punching him in the leg. As such, he found himself in time-out alone for the rest of the meal. As we all walked back to our room he opened up that he thought life wasn’t fair. And looking at us with tear-filled blue eyes he asked why do we always have to say goodbye to the friends we make? Like in February when his best friend at school moved to America. And before that when we moved to India. This is the boy who cried right along with me when we first moved here and felt so alone it hurt. He has been old enough to remember the friends and family we left behind. And quite frankly he’s tired of goodbye. My husband’s family moved quite a bit while he was growing up and even to this day we pause and try to think where he’s “from” exactly–so he gets this to some degree. But for me, I had the opposite experience. Growing up we moved one time and it was to the house next door. I had the same friends from kindergarten until graduation. If anyone moved it was a major event. And when new people came in they had to prove they could be like us–just ask my best friend in sixth grade who adapted her Ohioan accent to sound more Southern (I have videos that could black-mail both of us and testify to this fact). Here my son is the outsider trying to figure out where he belongs and he’s done amazingly well, but sometimes it gets to him, like it did this weekend. I don’t want him to close himself off in the future just because he’s afraid of the hurt that goodbye will cause later. What to do? For now we have encouraged him to talk about his feelings. Cry. And grieve the loss. I wish I could tell him it gets easier, but for me it hasn’t and he’s so much like me sometimes it’s frightening. The pain of separation from the people and places I care most about is not something I can get over by getting new friends or embracing a new place. I imagine this will be something we will dealing with for a long time to come as I’m not sure we’re the stay-in-one-place forever sort of folks. But I’m new at navigating the waters of wounded little hearts. So if you have any tips on how to make goodbyes easier I’d love to know what they are!